CWDM network, as an easy-to-deploy and cost-effective solution, has been applied in many areas. Although CWDM network is not as perfect as DWDM networks in data capacity, it still can satisfy a wide range of applications in optical applications. And CWDM is a passive network, allowing any protocol to be transported over the link, as long as it is at the specific wavelength. This article is going to describe several application cases of 10G CWDM network in different areas. Although 40G and 100G networks are developing rapidly, many of them still need to grow on the basis of 10G networks. And due to the high cost of 40G and 100G, 10G networks are still the most common networks to be deployed. Here are the main benefits of 10G CWDM networks. CWDM Mux/Demux is a passive component and requires no extra power, offering a cost-effective choice for network designers. Increased network connections and easy to evolve from 10G to 40G and 100G networks. For example, 10G CWDM network can combine DWDM wavelengths using the 1550nm channel on CWDM Mux/Demux. And if an operator want to upgrade its 10G network to 40G or 100G, there are various fiber components in market that can help him realize this conversion. Lower cost. 10G hardware has become cheaper, which make 10G CWDM network more economical. For example, buying one pcs 8 channels CWDM Mux/Demux which is the most often used in CWDM networks needs less than 330 dollars in some stores. And 10G CWDM optical transceivers are also very cheap now. As has mentioned above, 10G CWDM network has been widely deployed in different areas. Here are the common CWDM network infrastructures. A point-to-point CWDM network is the simplest network structure of CWDM networks, but it is the basis of other complex network infrastructures. By adding other components like CWDM OADM, the point-to-point CWDM network is easy to be changed into more complicated networks. The following figure shows a point-to-point CWDM network using 8 channels CWDM Mux/Demux. CWDM ring links are suitable for interconnecting geographically dispersed LANs and storage area networks. Business can benefit from CWDM by using multiple Gigabit Ethernet. As shown in the below picture, the four buildings are connected by several 8 channels CWDM Mux/Demuxes. CWDM uses different wavelengths to carry different signals over a single optical fiber, which offers many benefits to service providers that need to better utilize the existing fiber infrastructure. In this application, two Cisco switches are connected together through four 8 channels CWDM Mux/Demuxes. Signals are multiplexed and then transmitted through two strands fiber cables. As the scale expansion of many campus, the need for adding bandwidth of new applications is increasing too. And the new campus, school teaching and student life Internet require a lot of bandwidth resources, so building a new network is undoubtedly needs a large investment. Then how to make a full use of existing fibers is a problem needed to be resolved. In this case, four 8 channels CWDM Mux/Demux with expansion port are used to double the capacity on the existing fiber without the need for installing or leasing additional fibers, which reduce cost and labor. As the development of WDM technology and market, the deployment of CWDM network will be more lower. FS.COM provides affordable CWDM network components at a low price. Following is a list of our products. By multiplexing separated wavelengths from multiple ports onto a single fiber in the network, coarse wavelength division multiplexing (CWDM) network increases fiber capacity at a low cost. And all the CWDM components are passive and do not need power, which requires lower investment than DWDM networks and make it popular. This article intends to explore how to calculate the power budget and link distance in CWDM network, offering more conveniences for your CWDM network deployment. One important factor of network design, including various optical networks like DWDM and PON, is the optical power budget. Optical power budget is the amount of light available to make a fiber optic connection. The difference between the output power of the transmitter and the input power requirements of the receiver is referred to as the power budget. The power budget with various losses in an optical fiber, as shown in the picture below, is obtained by first determining the optical power emitted by the source, usually expressed in dBm, and subtracting the power (expressed in same units, e.g., dBm) required by the detector to achieve the design quality of performance (Receiver Sensitivity). Here is a common equation that can be used to calculate the power budget in a decided length fiber link. When designing a CWDM network, power budget is often used to determine the maximum distance that a link can support. The transmission power budget is the difference between the optical transmitter output power and the receiver sensitivity. In order to explain the calculation process clearly, all the equations will be given an example for illustrating. Power Budget = Tx Power – Rx Sensitivity. Example one. A -2 dBm optical transmitter and a -25 dBm receiver provide a total transmission power budget of 23 dB. As we all know, in a CWDM system, CWDM Mux/Demux, CWDM OADM and other components are common. And each one of them will introduce loss once added into the CWDM system. For example, when using a CWDM OADM in CWDM network, the point where a channel is dropped, added, or passed will cause a loss of signal strength. Therefore, when calculating power budget for a CWDM link, all losses must be added together. As shown in the following equation. Example two. Here is a link A shown as below. There are four CWDM Mux/Demuxes and two CWDM SFP transceivers in this link. 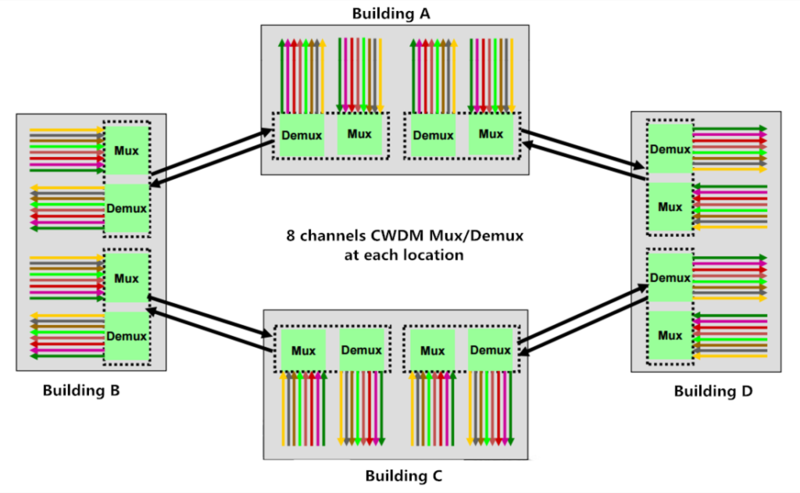 The Mux/Demux #1 and Mux/Demux #4 are 8-channel CWDM Mux/Demux. The left two is 4-channel CWDM Mux/Demux. Link A is the distance from CWDM SFP #1 and CWDM SFP#4. Each CWDM Mux/Demux has a low insertion loss. For instance, the insertion loss of the 8-channel CWDM Mux/Demux is less than 3.1dB (including connectors and adapters). Here is the calculating process. After determining the power budget for a fiber link, we can use the value to calculate the maximum distance that the link can support. The calculation equation is shown as below. Usually, a buffer of 2 dB is subtracted from the power budget to account for other factors that may affect the loss of transmission power. These factors include fiber aging, temperature, poor splice, etc. Fiber attenuation is the loss of signal strength as it travels through the fiber. The attenuation varies with the wavelength. Typical values are 0.2 to 0.35 dB/km. The maximum supported distance of link A is 40km. Knowing how to calculate the power budget and transmission distance can help engineers estimate the CWDM network deployment cost, and also can avoid some unnecessary problems in network design. This post gives a clear illustration to calculate them. Hope it would help you. In addition, FS.COM is a professional manufacturer and supplier of optical components. If you have any need, welcome to visit our website www.fs.com. How to Expand Bandwidth in PON Network with CWDM Technology? PON (passive optical network) is one of a common optical fiber network architectures. It is characterized by the “splitting” of the optical fiber one or more times, resulting in the sharing of optical fiber among multiple users. However, as networks grow in terms of subscriber counts, the scope and number of services offered, expanding the network bandwidth is inevitable. Coarse Wave Division Multiplexing (CWDM), known for its low cost and scalability to increase fiber capacity as needed, is a preferred method for PON network expansion. This article will focus on using CWDM technology to overcome bandwidth limitations in PON access networks. Fibers in a PON are typically shared with several users. Hence the bandwidth of the fiber originating at the CO (center office) is shared among a group of users. The splitting of the network is accomplished by optical splitters. These splitters can split the fiber 2-32 times, which may introduce high losses in the network. Besides, as different places in a same network need different wavelengths, CWDM Mux is often deployed to multiplex these signals on a single fiber. In PON (Passive Optical Network) network, whether in ring structures or point-to-point arrangements, different optical nodes need specific wavelengths. Therefore, at each node, a CWDM OADM is used to drop or add certain channels from the fiber as required,. Then the signals will be transmitted to the user through optical fibers. The following picture shows a simple PON network. How to Expand Bandwidth of PON Network Using CWDM Technology? In PON networks, OLT has two float directions: upstream (getting an distributing different type of data and voice traffic from users) and downstream (getting data, voice and video traffic from metro network or from a long-haul network and send it to all ONT modules on the ODN). The following figure represents a situation where existing subscribers intend to upgrade to higher value added bandwidth services. In order to satisfy customers’ needs for IPTV, VoIP, video on demand etc., the 622 Mb/s downstream capacity between the CO and the OLT, providing roughly 20 Mb/s to each subscriber, must increase. Considering there may be new subscribers and services added, the targeted bandwidth requires at least a downstream CO/OLT link bandwidth of 2.5Gb/s. Therefore, four CWDM wavelengths are introduced to multiply the channels passing between the CO and OLT. This introduction of passive CWDM Mux/Demux can relieve the fiber exhaust effectively. The below figure shows the upgrading process. Compared with laying a new fiber cable, the upgrade with passive CWDM is easily accomplished within hours after some modest investment in network planning. And the sum of material, labor, equipment and training expense is far less, which explain why many enterprises, private business users of LAN and data storage networks use passive CWDM too. EPON stands for Ethernet passive optical network. It is an enabling technology that benefits consumers. Here is an EPON network, which was conceived to serve up to 64 subscribers. All users share a single bidirectional optical feed line. With the need for IPTV, HDTV and other higher bandwidth services growing, the downstream capacity 16Mb/s should be improved. The picture below shows the same EPON deployment upgraded to 4Gb/s bandwidth capacity. This upgrade uses 4 channels passive CWDM Mux/Demux to extend the whole network capacity, allowing the downstream capacity increase four times without affecting the upstream traffic. Using CWDM Mux/Demux effectively increases the network bandwidth capacity and reduces the cost. At the same time, it requires minimal modification of the existing infrastructure, which also saves labors. CWDM technology offers significant benefits of low investment, minimal operating cost and very simple and straightforward upgrade planning and implementation. In addition, passive CWDM also provides scalability and network flexibility for network growth and bandwidth demands in the future. FS.COM supplies different channels of CWDM components. Welcome to contact us via sales@fs.com. Based on the same concept of using multiple wavelengths of light on a single fiber, CWDM and DWDM are two important technologies in fiber optical communications. As we all know, although the transmission distance of CWDM network is shorter than that of DWDM, it costs less and has the scalability to grow fiber capacity as needed. This article intends to give a simple introduction of components in CWDM networks and to explore some examples of CWDM network deployment cases. CWDM Mux/Demux, which is based on the film filter technology, is the basic component in CWDM networks. It can combine up to 4, 8 or 16 different wavelength signals from different fiber extenders to a single optical fiber, or it can separate the same wavelengths coming from a single CWDM source. That’s why CWDM can extend existing fiber capacity. A CWDM OADM is a device that can add (multiplex) and drop (demultiplex) channels on both directions in a CWDM network. It can add new access points anywhere in CWDM systems without impacting the remaining channels traversing the network. With this ability of OADM, the access points can be added to liner, bus, and ring networks, where the dual direction ring design provides redundant protected architecture. Optical transceiver is a necessary element in optical networks. And CWDM optical transceiver is a type of module supporting CWDM network application with CWDM wavelengths. When connected with CWDM Mux/Demux, CWDM transceiver can increase network capacity by allowing different data channels to use separate optical wavelengths (1270nm to 1610nm) on the same fiber. And the common CWDM transceiver type is SFP, SFP+, XFP, XENPAK, X2, etc. Description: there are five buildings (Sheriff, Courthouse, Admin, Police & Fire, & Public Works) connected via multimode fiber cables (MMF) or single mode fiber cables (SMF). These buildings are linked via multimode SFPs in an existing D-link switches to create one network for internal use of the city offices. Below is a simple graph to show the situation. Requirements: the goal is to install a single mode fiber network in town to connect numerous buildings. Some of these buildings have access to the city LAN. The Public Works building need to connect with Youth & Recreation Center, Library, Immanuel Lutheran School and the Senior Center. And all these buildings should have unfiltered Internet. Besides, the Waster Water Treatment Plant should be connected passing through the Senior Center. All these services are achieved using CWDM technology. Solution: according to the requirements, this is a CWDM networks with several buildings to connect with. Here is the solution diagram. In the diagram above, we can see there is an 8CH CWDM Mux/Demux connected with the switches. According to the requirements, Youth & Recreation Center, Library, Immanuel Lutheran School and Senior Citizen Center should be connected with the Public Works and need unfiltered services. Therefore, a 4CH CWDM OADM is placed after the CWDM Mux/Demux. Then the four wavelengths will be drop and into the four buildings. In addition, another CWDM OADM is deployed in Senior center to connect the Waster Water Treatment Plant, to meet the requirement. And each site also needs to use CWDM optical transceivers. Description: on site A, there are three Ethernet switches and a T3 router. And their working wavelengths 1470nm, 1490nm, 1510nm, 1530nm and 1610nm. Other three sites B, C, and D also have three Ethernet switches. And a T3 router is in site E. As the following figure shows. Requirements: Considering the cost, all the wavelengths should be transmitted on a single fiber using CWDM technology. Solution: according to the requirements, here is a simple diagram showing the solution. In order to save cost, a 4CH CWDM Mux/Demux is used to multiplex four wavelengths (from three switches and one router) into one single fiber. At the first site B, a 1CH CWDM OADM is installed to remove one wavelength which is associated with network B. And other three sites are the same—dropping one wavelength associated with corresponding switch or router. 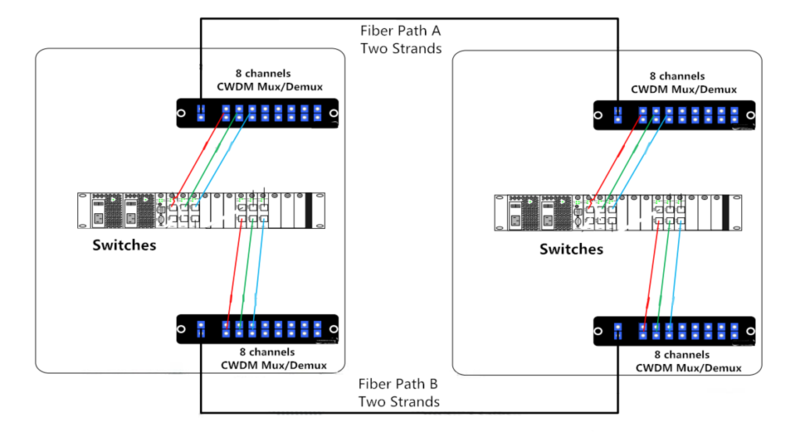 This article mainly introduces two CWDM network deployment examples. All the components like the CWDM Mux/Demux, CWDM OADM and CWDM transceiver are available in FS.COM. If you are interested in them, please contact us via sales@fs.com.